Today, you don’t have to be a fitness junkie or James Bond to use wearable technology. CEO and other C-suite executives are taking advantage of wearable technology to gain a competitive edge. Warehouse workers use it to prevent accidents while operating heavy machinery. Heart patients wear it to keep an eye on their health. Wearable technology has set its sights much higher than Fitbit-style gear—and it’s poised to meet goals you wouldn’t believe. Perhaps the fastest-growing trend in technology is wearable tech, which began in earnest a few years ago with fitness gadgets, and quickly evolved into the realm of business. Wearable technology can track employee efficiency, prevent worker injury, and predict future health problems by measuring breathing rates and heartbeats per minute. It can also give CEOs instant access to manuals and data, increase security, and allow businesspeople to stay connected without being locked to screens. Google Glass, for instance, allows users to wear eyeglasses that take photos and video, as well as search Google and make use of facial recognition software. Google Glass enables employees to recognize customers as they walk in the store and even pull up favorite items from previous purchases. Instant access to personal consumer information can significantly help a business engage with customers and encourage brand loyalty. Wearable technologies can enhance employee careers by keeping data about their health, safety, and efficiency. Tracking employee health is one of the main uses of wearables currently; it promotes fitness and prevents injury. Advances in wearable technology include badges that give trainees real-time advice, and bracelets that give employees immediate access to crucial information. Better-known devices, such as the Apple Watch, save time and increase efficiency by granting access to information and facilitating collaboration without the need for screens. 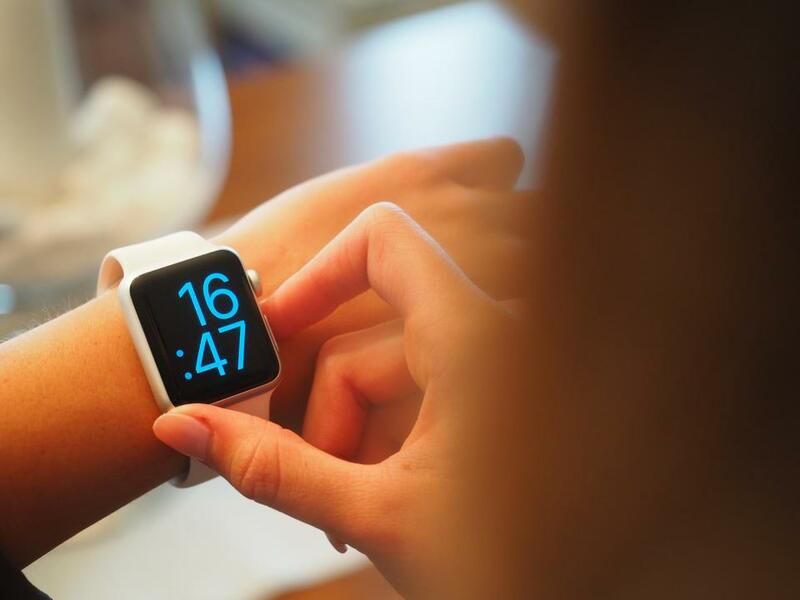 The realm of wearable technology continues to expand, tackling new business concerns and using advances in digital technology to its advantage. If your business has restricted areas under strict security surveillance, for example, you can use wearable technology to monitor and track employee or visitor locations. Wearable technology is far from perfect. Some of the pitfalls of wearables in business today are that management may not have the talent and skills to take advantage of wearables. Without the proper ability to understand user experience (UX) design, staff may be more confused than helped by wearable technology. Before adopting wearable technology, consider which business opportunities hold the most potential for your company. Wearable tech assists in training, fitness, safety, customer engagement, and more. Decide which wearable would benefit your company the most before committing to one. For example, hands-free computing can significantly help the business sphere when used correctly, but it may not be the right solution for everyone. One of the limitations still plaguing wearables is that they don’t provide enough information to keep users interested. This is the issue wearable technologies currently face—how to make wearables attractive in the long term. However, new developments in wearable tech may succeed in making them even more user-friendly. To ensure your enterprise stays on the cutting edge of business technology, consider the benefits of wearable tech. Try out a product yourself before introducing it to employees to see if it’s a good fit for your business. Start now with wearables to gain a competitive edge. As technology advances, wearables may become the new mobile device of choice.